The Beast from the East brought the country to a standstill in early 2018 and while we’ve not had much snow so far this winter, it pays to be prepared. Here at MCN we love any excuse to get on two wheels and learn something new. 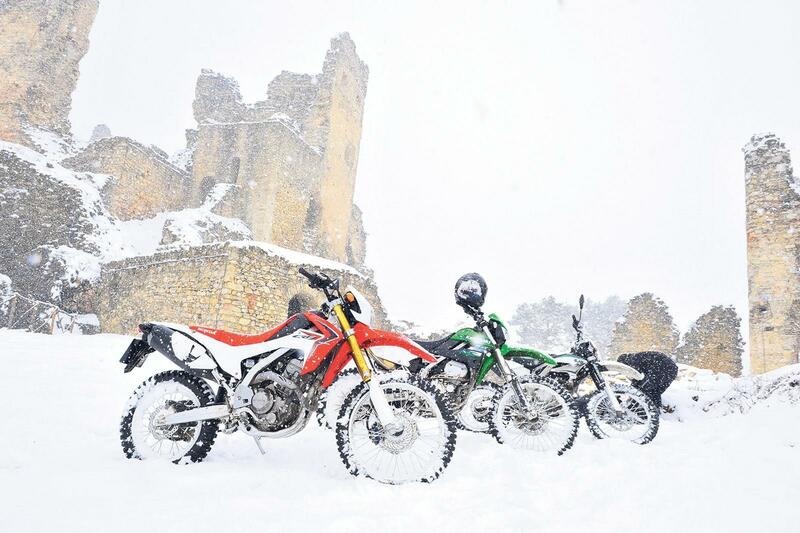 So, we've put together a few handy tips for riding in snow should you be left with no choice or like us, just want to have a crack at it. Compacted snow is the worst kind of snow when it comes to riding. It's spent the last few hours been driven over by cars and as a result is incredibly slippery and hard. If you get the option, freshly fallen snow is much easier to ride on and less risky. If you follow in the wheel tracks of other vehicles then that snow could be slippery and it might be best to ride in the untouched stuff. Much like riding in the wet, make sure you only do one thing on the bike at a time. Brake, then steer. Turn, then accelerate. Grip levels could be almost non existent, so braking while going round a corner - no matter how often you do it in the dry - could result in a fall. This will make your bike's response much more docile and easier to control. This goes for everything; brakes, throttle and steering. It's an obvious one, but if you're not used to riding on snow it's easy to lose concentration and give it a little too much. Approaching a junction or corner you should start braking long before you normally would. Keep this in mind for following distances as well, you don't want to go clattering into the back of a car because you didn't have enough room to stop. Use both brakes to keep the bike a little more balanced and avoid putting too much stress on the front tyre. Make sure you get all your braking done before you need to turn. Cornering needs to be approached with similar caution. Turn in slowly and deliberately - no sudden inputs. Don't touch the throttle until you're completely upright, and even then turn it incredibly gently. All it takes is a small patch of compacted snow or ice for the rear wheel to step out. IF you feel the rear stepping out just yank in the clutch and let everything settle back down. Just take your time, don't try to be a hero. Focus on doing everything as smooth as possible and stay as relaxed as possible. You don't get any bonus points for getting to your destination any quicker. If you've been riding in snow for a while it can be easy to get complacent, but snow can hide many dangers. That layer of freshly fallen snow may be covering a layer of slippery compacted snow, a patch of black ice or something else entirely. It's much easier to keep your control inputs light and stay relaxed when your teeth aren't chattering uncontrolably. Layer up, with a good thermal base layer on the bottom and heated gear if you have it. Make sure to keep your neck covered to stop any snow or icy wind getting down your back. Any gaps in your gear will be exploited by the cold. Most importantly, make sure your hands are warm. There's nothing worse than trying to ride smoothly and gently when your fingers feel as big as sausages and you can't feel anything. If you get too cold stop and warm yourself up on the engine or exhaust.